Love to explore? Find the road less traveled? Those hidden gems that only the locals seem to know about? Well the Fredericton area waterfalls top my list! So much so that Fredericton Tourism, after seeing all of my waterfall explorations on my instagram account, asked me to do a guest blog on some of my favourite Fredericton waterfalls. The Greater Fredericton Region is home to countless waterfalls that many of the locals are actually unaware of. Many can be discovered if you follow a stream for a period of time. They may not be of great size, but they will be beautiful nonetheless. Mactaquac is a region known for being secluded from the city buzz and steps away from nature. Howland Falls, which is my favourite waterfall to explore, is located in Mactaquac on Bear Island. These falls are relatively easy to find. If you are leaving Fredericton, follow Woodstock Road which turns into Highway 102, turn right onto Mactaquac Road so you are driving over the dam, follow Highway 105 for a while and you will reach Bear Island, turn right onto Scotch Lake Road for a few kilometres and when you drive over a small bridge you can park to the side and the falls are below. There are two drops for these falls and if you hike down and follow the river you will find both. The second drop is spectacular. When you are standing next to these falls, not only are they beautiful and breath taking, the oxygen you breathe feels cleaner and provides a flooding sensation of bliss. The falls are great to photograph and if you are brave enough to go into the icy water it is an even greater sensation of happiness. 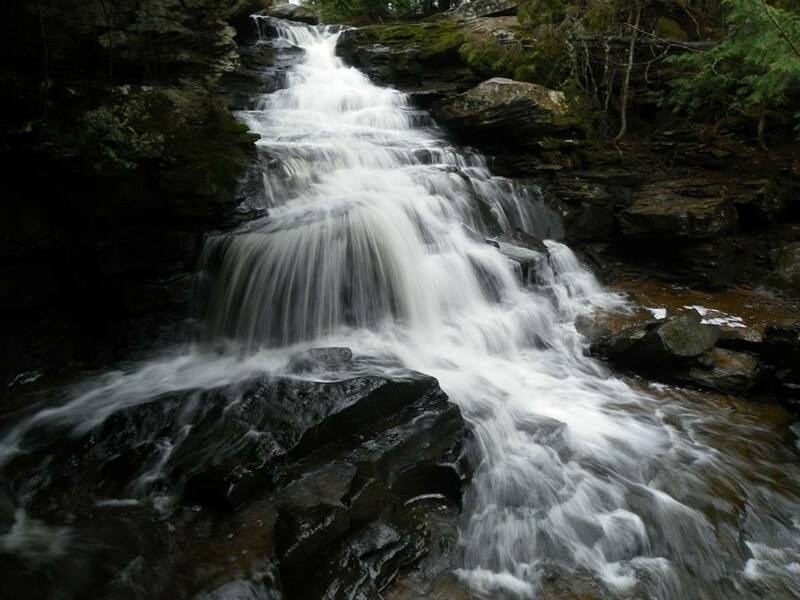 There are countless other waterfalls that are waiting to be explored in York County, Carleton County, Albert County, etc, you can find a full list on the Waterfalls of New Brunswick website. Other falls worth checking out include Howland Falls and Kelly Creek Falls – thanks for the tips James Hoyt! But we’re not done! There’s still lots more waterfalls around Fredericton to share so stay tuned for another post in the fall (to enjoy the foliage). But in the meantime, tell us below, which Fredericton area waterfalls are you’re favourite to visit? For directions to most falls be sure to check out the website “Waterfalls of NB – Google Maps”. Ashley Swinton originates from Salt Spring Island, British Columbia which is known for its own abundance of beauty. When she isn’t exploring the outdoors she can be found with a coffee and book in either hand. For more of her adventures, follow her on Instagram.